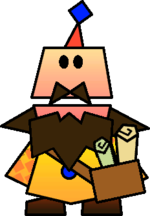 Flamm is a map salesman found in B1 of Flopside, which is accessible after Chapter 5 during the game Super Paper Mario. His nickname is "The Map Chap". He is the flopped version of Flimm, and together, their names are a pun on "flimflam", which means "a swindle or other deceitful action". He is necessary to gain the map tab in the games menu. By using Fleep in the various chapters where the X mark on a map is after buying one from Flamm, Mario and his pals can uncover various treasures, including the Catch Cards of the Chapter Bosses. The maps sold by Flamm are thought to have been collected by Heronicus's Flopside version, meaning he can somehow visit other dimensions, including Castle Bleck. This page was last edited on August 29, 2018, at 18:45.